Yesterday, oldest granddaughter, Eloise, all of 3 going on 30, and I had a matinee movie date. We went to see Pixar’s “Inside Out”. It is a magically creative and fun adventure that takes place inside of the head of an eleven year old girl. Her emotions; joy, sadness, fear, anger, and disgust are the characters of the movie, partnering with the little girl and her parents to provide an experience that I suspect will stay with me a long time. I marvel at the creativity and ability to translate unique ideas into wonderful experiences through film. But the movie isn’t really the point of my essay today, just the very significant back drop. Any time I get to spend with my granddaughters is a special treat for me, and I have recently figured out that God has so graciously and sweetly provided me with this season of availability. I intend to make the most of it! Thus, a movie date at 11:00am on a Tuesday afternoon. When my daughter dropped her off Eloise looked the little fashionista, as always. She insisted on wearing her white sweater, even though it was already close to 90 degrees when we got in the car to go to the movie. Of course she was way ahead of me, as usual, in her thinking because the movie theater had the air conditioning on full blast and the sweater provided much needed warmth for those precious little arms. As we left my house to go, a flash light on the utility room hutch caught her eye and she was adamant that we bring it with us. This was also a brilliant move on her part. Otherwise we wouldn’t have been able to see the menu in the dark theatre. Yes, menu. I splurged and we went to one of those theatres that provide full service food and beverage, ordered and brought to you while you watch. Eloise is so much fun to splurge on. The best part is, while she takes delight in all things, she does not seem overly impressed by extravagance or show. I hope she can continue this balanced perspective in life. Way too often I have been foolishly impressed by the “show” only to miss the significant. I’m learning much from Eloise! We got settled in our comfy seats and after taking a look at the menu we ordered, for our appetizer, the biggest bowl of popcorn available and some water for me. There was juice listed on the menu for kids but when I inquired if they had apple juice I was told no, only orange, cranberry, or pineapple. Not having apple juice on a kids’ menu seemed a problem to me but not to Eloise. Her eyes lit up at the word pineapple. Something about it must have sounded exotic or especially fitting for this occasion. She savored that juice throughout the whole movie experience and when I took her home she proudly informed her mother that she drank some really “cool” juice at the movie. Her smile alone made me really glad they did not have apple juice. I wish I could be as sensitive to those glimpses of the glorious breaking through the mundane in the most unexpected ways. We munched our popcorn down to the point we were almost jabbing each other’s fingers as we dove for another handful. All the while her eyes were fixed intently on the screen. I could see the colorful reflections in her eyes whenever I snuck a peek to see if she was enjoying the movie. There were some loud parts, and scary parts to a three year old but Eloise only once looked away. Most of the time in the scary parts, which were always a little too loud for those precious ears, she would cup her ears and look worried, and then relieved after I would whisper to her that all would be well. This took courage on her part, forcing herself to look through the scary on the hope and promise of her mimi that all would be well. I wish I could be as brave and full of faith as to always believe that all will be well. I can promise it for others but so often fail to believe for myself. When we began eating the salt off the wax paper in the popcorn basket I figured it was time to order something more for lunch. After a quick and quiet consult with Eloise I settled on cheeseburger sliders and French fries. Tom and I have recently been on a no/low carb diet and this was totally out of bounds but, it was a date with Eloise! 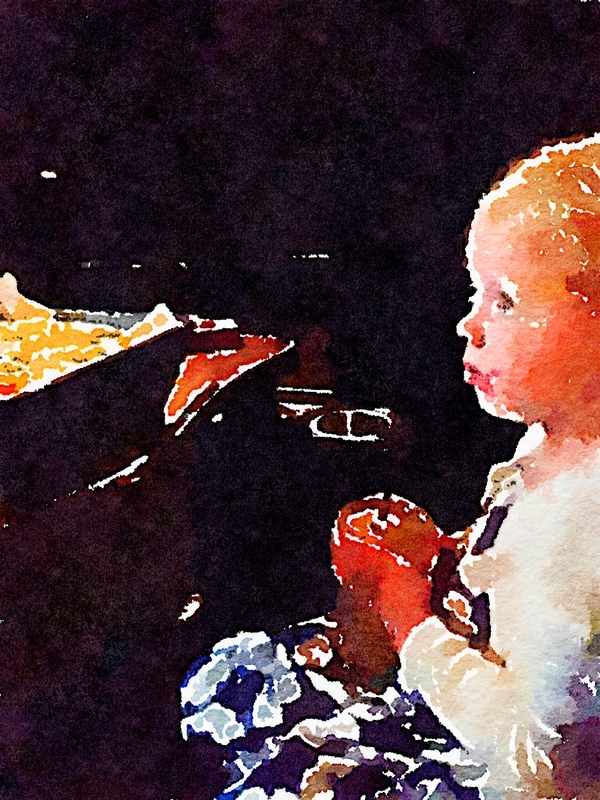 By the time the burgers came Eloise was so engrossed in the movie that she, rather like a zombie, would reach into the basket blindly, eyes fixed on the huge screen before her, and chew in slow motion, or just hold the morsel absentmindedly before her. When the movie was over it seemed to her a perfectly fitting time to turn her attention to a leisurely lunch. Which seemed like a good idea to me as well and it would have been great if three different employees hadn’t come by in an attempt to pick up our food. I began to get a little nervous but not Eloise. Another lesson learned, another trait admired. She is not overly sensitive to the anxiety of others, which I was totally absorbing from these employees charged with getting the theater ready for the next showing. After barely five minutes had passed, one of them hurriedly asked if we wanted a to-go box. Unfortunately they had no to-go cups for her pineapple juice. I wish I had just discreetly put the plastic cup in my purse instead of asking. Subconsciously I guess I thought an alarm might go off. Or that it would be a sin! After I dropped Eloise off at her house and drove back home I felt the same sweetly sad emptiness that I feel each time I’m with either or both of the girls and then they are gone. It is overwhelming to me how much I love them. A grandparent’s love is not more or bigger than a parent’s love for their child. But it’s a little different. A little less complicated, maybe even more unconditional. I don’t know exactly but it’s beyond words. As I think about Eloise and the movie we saw together, which was a beautiful reminder of what fearfully and wonderfully complex human beings we have all been created to be, there is a prayer that wells up in my heart for her and for her sister, Avery. And for all children really. My prayer is that the love of God will protect them from the brokenness of this world. But even as I write that I know it is a foolish prayer. We are part of the brokenness of the world and as such we are connected to it, both good and bad. Maybe the better prayer is that the love of God will protect them in the midst of the brokenness, the world’s and their own, both of which they will discover all too soon. I pray that they will be brave enough to face life head on and wise enough to see through the intimidation of conformity for the sake of control. I pray that they will be confident enough to freely celebrate their uniqueness and connected enough to celebrate that in others. I pray that they will be sensitive enough to be forgiving and gentle with themselves and with others. I pray that they will be faithful enough to trust that the Love that holds them will never leave them. I pray that they will be curious enough to ask questions, even if those questions have no answers. I pray that their belief in the unconditional nature of God’s love will be strong enough to weather any pressure imposed on them to perform for approval. And, I pray that for them the love of Christ will mean the love of all. This entry was posted in boomers, connection, Faith, family, grandchildren, Lessons Learned, nonfiction, Relationships, Spirituality, unconditional love and tagged faith, family, God's love, grandchildren, heart, insideout, lessonslearned, love, prayer, prayersoflove. Bookmark the permalink.